Let baby enjoy the comforting and reassuring bordered mode while lying on his back and enjoy the peace of mind this mode of use offers. 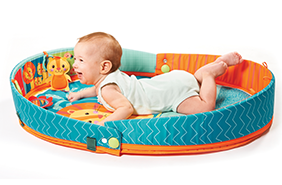 Use the toys engaging elements to encourage and extend baby's tummy time. 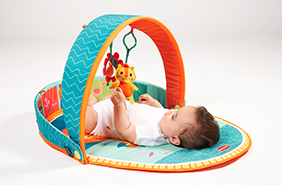 Baby can enjoy the dangling animals in the baby gym mode, practice her grip and explore the toys textures and sounds.